With albums from Blu (C.R.A.C. and Johnson&Jonson), Giant Panda and Shawn Jackson, Tres Records is definitely on the move this year. 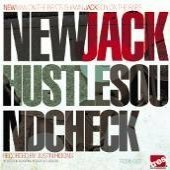 Next up for the L.A. imprint: a collaboration between Newman from Giant Panda and Mr. Jackson as New Jack Hustle. The duo’s album Sound Check drops October 21. Standout tracks include ‘Lionel,’ centering around an elastic beat and Latin atmosphere, “New Shades”‘s throbbing vibe and Shawn Jackson’s chant esq. rhymes, and “Ronald’s” breezy, chill educing [sic] beat countered by the political observant rhymes of Shawn Jackson and Vursatyl. This entry was posted in News and tagged Giant Panda, New Jack Hustle, Newman, Shawn Jackson, Tres Records. Bookmark the permalink.